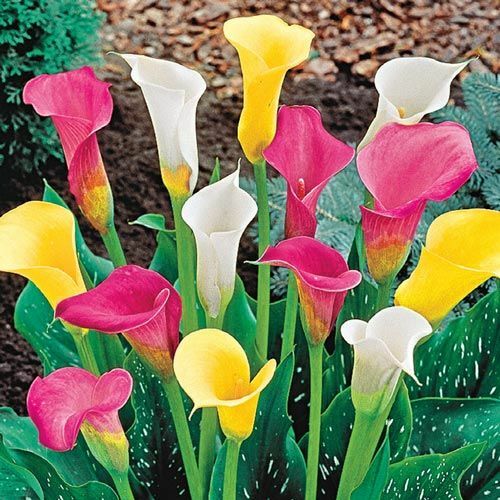 Create a vibrantly colourful spot in your garden or on your patio with the Calla Lily Mixture. These rhizomes produce large chalice-shaped spathes or sheathing bracts in a variety of hues, and because each rhizome yields a number of stems with a bloom at the tip, they make an excellent show. The attractive green and white-spotted leaves complete the look of these eye-catching zantedeschia. 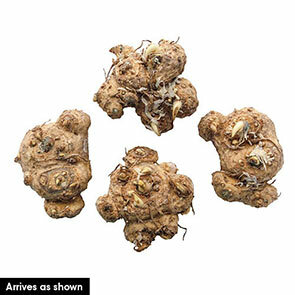 Thriving in clay, loam or sandy soil, the lily bulbs like their growing medium moist but well drained, and they prefer full sun or semi-shade conditions. Add organic compost to the soil before planting the callas, space them 6 inches deep and 4 to 6 inches apart, and feed them every month during the flowering period. These lily bulbs grow well in hardiness zones 3 to 10; lift the bulbs for winter if you live in zones 3 to 7 as they are not frost-resistant. The large waxy flowers make a dazzling, sophisticated display of cut flowers in your living space. If you prefer to keep them in their natural habitat, remove the flowers and their stems once blooming is over, cutting back on water to allow the plants to dry out. Increase the appeal of your garden with the Calla Lily Mixture. Spectacular hybrids will greet you each summer in glorious living colour.